President Trump signed the Music Modernization Act into law on Thursday, a move that will affect a wide array of industry standards for the way artists are compensated. The act is a bipartisan agreement between artists, publishers and digital streaming platforms, and the sweeping legislation will update many policies that haven’t been changed for decades. The MMA’s three main accomplishments are: guaranteeing streaming royalty payments to artists for songs recorded before 1972; stipulating direct streaming royalty payments to record producers and engineers; and updating licensing and royalty rules for streaming services to pay rights-holders via a new independent body, known as the Music Licensing Collective, governed by songwriters and music publishers. The Nashville Songwriters Association International, a major proponent of the bill, noted in a press release that “songwriters will see an immediate 44 percent mechanical royalty increase beginning in January 2019,” with royalties increasing from there over the next five years. In addition to those three landmark actions, the act updates the standard by which songwriter streaming rates are established by replacing an outdated 1909 law that governs songwriter mechanical or sales royalties. It also eliminates the disastrous Notice of Intent (NOI) program administered by the U.S. Copyright Office that shifted the digital mechanical licensing burden back to songwriters. 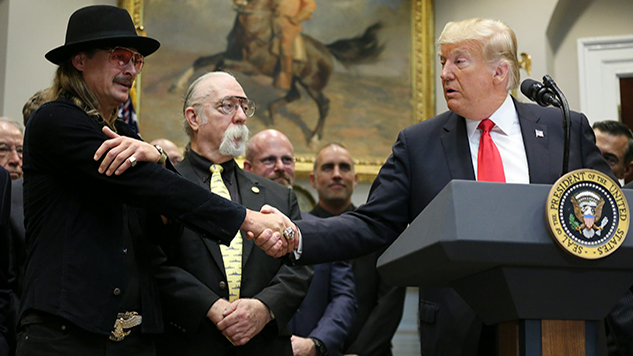 President Trump celebrated the signing by hosting a variety of music icons, including noted Trump supporters Kid Rock, Mike Love and John Rich (of Big & Rich). Notably absent was born-again Trump supporter Kanye West, though he later joined the president for a predictably absurd meeting in the Oval Office. You can watch the signing of the MMA below.